Ukraine: Who is the bestselling rockstar tipped to become the country's next president? In the weeks and days leading up to Ukraine’s Independence Day on Friday, Kiev was awash with hint, rumour and speculation. This would be the day that the nation's favourite rockstar Svyatoslav Vakarchuk would finally announce his intention to run for the presidency. He would do it, it was suggested, at the end of his sellout 80,000-plus concert in the capital’s Olympic Arena. 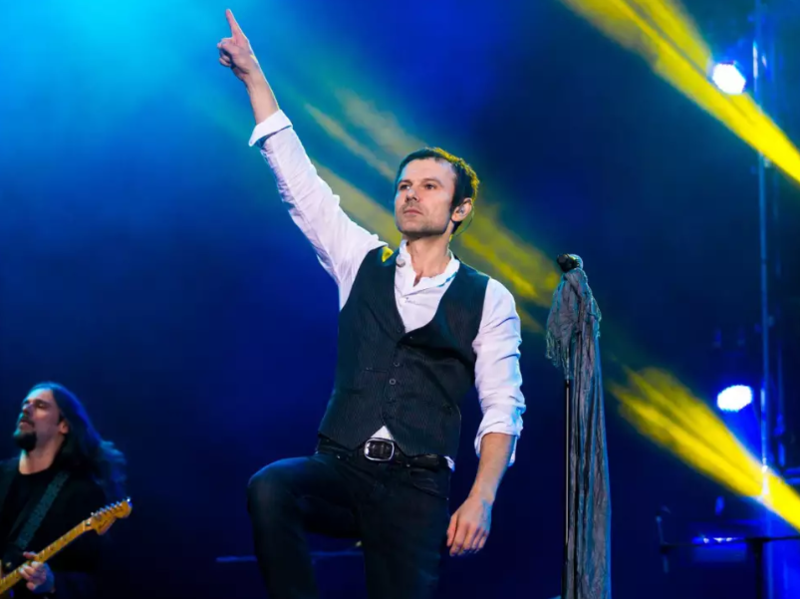 Opinion polls conducted throughout the year suggested the Okean Elzy frontman would be in with a fighting chance at next March's elections. Stranger things have happened in Ukrainian politics, after all; and as the man who penned the soundtracks for two revolutions, he already has an easy way in with the electorate. Even from a standing start, polls have suggested he would be within touching distance of favourite Yulia Tymoshenko, and well ahead of the current president, Petro Poroshenko. In the end, Vakarchuk kept people guessing. At a press conference arranged before the concert, the 43 year old declared there would be a “moratorium on politics”, and said he would only answer questions about his music. There would be no official declaration – just noisy guitars. Born in Zakarpattia, the sleepy, rustic region on the western border, Vakarchuk moved to the nearest big city, Lviv, when he was three months old. His father was a scientist, a widely published quantum physicist, who later became a Minister for Education in the post-Orange revolution government. Svyatoslav would follow in his father’s professions on both fronts. At university, he also specialised in physics, defending a PhD on string theory. And in 2007, he made inroads into politics, becoming an MP in the national parliament. He would quit after less than a year in protest at the "atmosphere of corruption". To this day, he is one of few MPs to voluntarily walk away from the lucrative business of governance. In between physics and politics, Mr Vakarchuk became an international superstar. Already in the 1990s, his group was hugely popular in Russia, playing to sell-out crowds from Kaliningrad to Vladivostok. What made this even more remarkable was that the band were singing in Ukrainian – hitherto considered an unsophisticated rural language. Two revolutions made them political icons at home. Their songs “Rise up, my dear,” and “I won’t give up without a fight” were played on loop. They played to hundreds of thousands at the height of the Euromaidan protest in December 2013 – just before those protests turned deadly. By the time president Viktor Yanukovych fled the country in February 2014, Mr Vakarchuk was already being talked about as a future leader. Mr Vakarchuk did not rush back into politics. Petro Poroshenko instead emerged as the country’s leader, beating Ms Tymoshenko into second place. This time around, things are more unpredictable, says the reformist MP, and former journalist Sergii Leshchenko. Ukrainians are tired, pinched by four years of war and incomplete reform, he says, and yearn for serious change. This opens the presidency up to “unconventional” political forces like Vakarchuk, or even Vladimir Zelensky, a political satirist who has also put his hat into the ring. Even without a declaration, many have already begun to attack what they describe as the musician's political inexperience. In a rare intervention, former President Viktor Yushchenko suggested the presidency was a step too far from someone untested in government. A spin doctor advising the President Poroshenko campaign told The Independent that it would be “simple” to attack “obvious” weaknesses. Members of Yulia Tymoshenko’s inner circle meanwhile suggested the musician would “struggle from a standing start” if he decided to run. Judging from feedback at the Friday concert, Mr Vakarchuk has yet to convince his faithful. For every fan supporting the idea of a presidential run, there were many critical voices. Friends and supporters say Ukraine's political classes would be wise not to underestimate the celebrity. Vakarchuk was not your average rock star, they said. He had surrounded himself with "clever" people – self-made businessmen, academics and journalists. A "voracious reader," and "deep thinker", he was also a "shark" when he needed to be. "He's tough as nails, and I know because I negotiated several contracts with him," said Petr Chernyshev, a local businessman who recruited Vakarchuk to front advertising campaigns for Carlsberg and Kyivstar, a local telephone operator. “Of course, he'll have to get ready for a level of attack he is not used to yet. Everyone will attack him. But I think he’ll give as good as he gets. I hope he runs. » New polls: Secrets of Tymoshenko and the other "public servants"
» How ratings of Ukrainian presidential candidates changed?